I'm Beth, a vertically-challenged photographer, stylist, recipe developer and explorer. Welcome to my blog! Wide awake and starving at 4 am, I can be found in the kitchen chopping hazelnuts to make some jammy tarts. I just got home from a couple of weeks in Italy, and my internal clock hasn't figured out that I am in a different time zone yet. Basically, I think this some form of deep denial that I am no longer on Italian soil. So, I'm up before dawn, baking and singing "That's Amore". There isn't much in the fridge, but I do have a big bag of hazelnuts I brought back from the Langhe. I'm really anxious to try my newly acquired recipe for Torta di Nocciola. This is a simple snacking cake made with only eggs, olive oil, sugar, and ground hazelnuts. You see it everywhere in Piedmont. I first tasted it in Asti last fall, and fell in love. It's one of the things I would request for my last meal, should I ever face execution. In fact, I spent a lot of time trying to reproduce this cake at home last winter, and never really could...I did, however, come up with a delicious recipe for a chocolate hazelnut torte. That recipe is here. Because it's the middle of the night and I have no eggs, the torta will have to wait. Instead, I'll make an old favorite recipe for almond and apricot tart from The Silver Palate Cookbook. 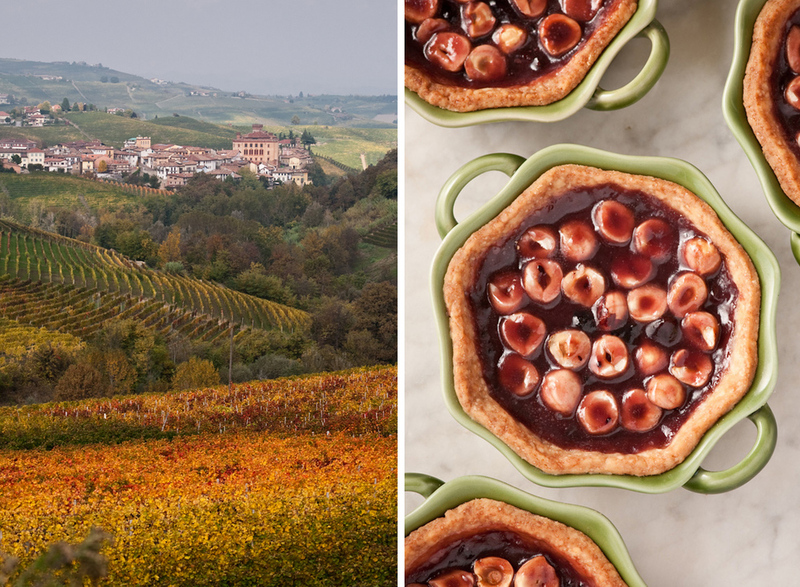 By substituting a few ingredients, I'm aiming to recreate a Crostata that I particularly enjoyed one morning in the town of Barolo. I'm using Tonda Gentile delle Langhe hazelnuts with my homemade black currant jam and a shot of Frangelico. I've also added a little bit of whole grain flour to the crust for flavour and texture. VIneyards of Barolo in the fog. If you'd like to make these tarts yourself, the recipe is as follows. Combine flour, sugar, and the butter in the bowl of your food processor fitted with the steel blade, and pulse until mixture looks like a a coarse meal. Sprinkle vanilla and water over the mixture, and pulse 2 or 3 quick bursts to incorporate. Turn out on to lightly floured board and gather into a ball. Dust rolling pin with flour, and roll out the dough until about 1/8 inch thick or so. You can either make one 9 inch tart or four 3 inch tarts with this recipe. For a single tart, cut an eleven inch round. To make individual tarts, cut 4 five inch rounds. Drape the dough over your rolling pin to transfer to tart pan/s. Chill in the fridge for at least an hour before baking. Line tart crust with foil and fill with dried beans or pie weights. Bake on baking sheet at 400F for 8 minutes with weights, remove foil and weights, and continue to bake for 5 minutes without. Remove from the oven and fill crust with black currant hazelnut mixture. Return to the oven and bake for another 15 minutes for individual tarts, or 18 minutes for single larger tart. Stir the sugar into the preserves first, until well incorporated. Add the remaining ingredients and stir until well combined. 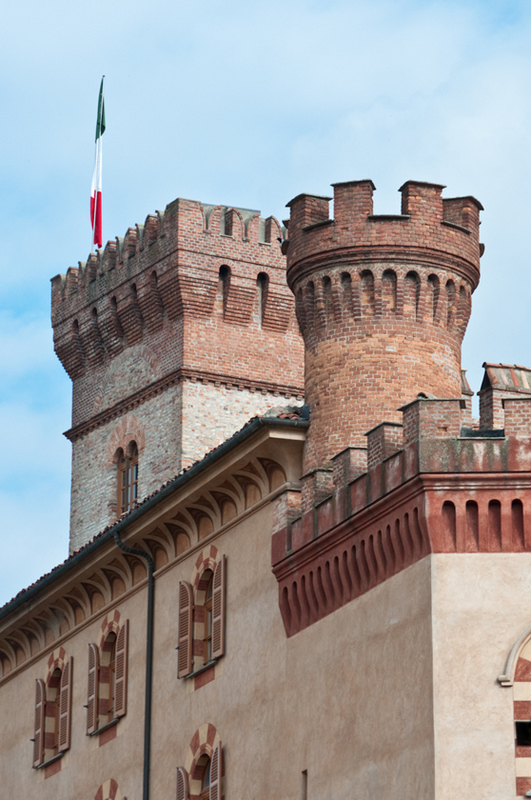 I learned so much on my travels through Piedmont and Tuscany. My notes are overflowing with recipes and ideas I can't wait to test and share. I'm working on a series of posts including recipes and photos from the Truffle Festival in Alba. Some other regional specialties from the Langhe that we especially enjoyed, including a very special Barolo pairing. A couple of preparations featuring the famous cheeses of Parma. As well as some of very traditional Tuscan dishes. Oh, and yes there will be more talk of wine. I hope you enjoy this little culinary journey through Piedmont and Chianti with me.